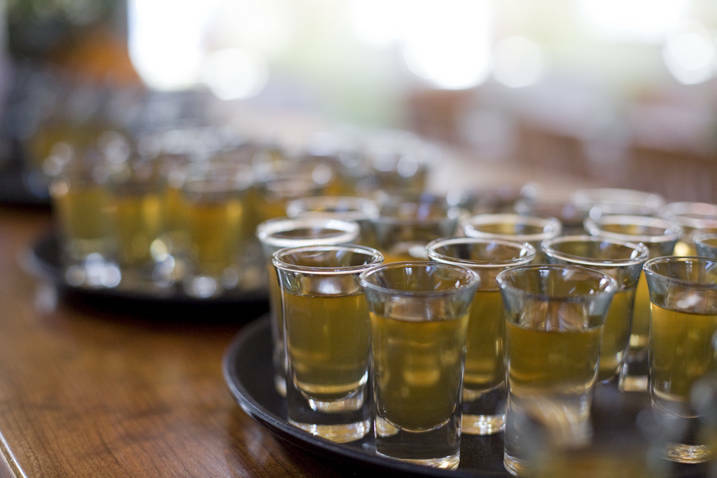 I can’t believe it took this long to write about something that is near and dear to my heart…and liver. 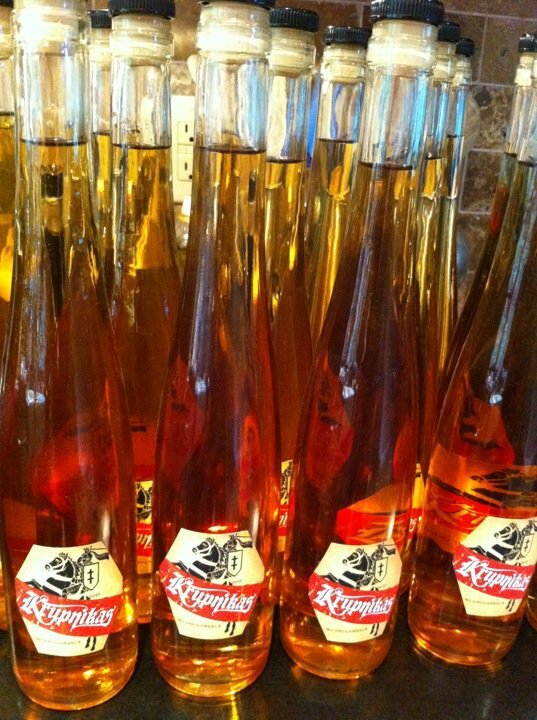 I’ve been making a Lithuanian honey liqueur called Krupnikas for over 30 years. (And no, I won’t be posting my secret recipe here.) It’s a honey-based liqueur that is popular in eastern Europe, especially in countries like Lithuania (where my parents were born) and Poland. Though most of the Krupnikas that I’ve tasted is similar, no two recipes are exactly alike. If you Google “Krupnikas,” you’ll find many different recipes for the stuff…some pretty good, some incredibly awful…and none as good as mine! But still…you can make it at home. I make it with grain alcohol, but if that’s not available in your state, you’ll have to settle for vodka. My Krupnikas making story started with my uncle, who would make batches of the stuff in his kitchen. Because I am the godfather of my cousin, Victor (his son), starting at the then-drinking age of 18, I got a bottle from my uncle every Christmas…and by New Year’s that bottle would be gone. It wasn’t long before I got very tired of waiting 51 weeks for another bottle and I asked my uncle if he would share his recipe with me. He never did that, exactly, but he did let me sit in on a brewing session and take notes. I took my notes home and tried to decipher what I wrote. Since there was no such thing as the internet back then, I drove all over New York in search of some of the more exotic spices used in making Krupnikas. I became a regular in several Asian and Indian stores, where they looked at me somewhat suspiciously as I brought my spices to the counter for purchase. Over the decades, through trial and error, I tweaked and even drastically changed my uncle’s original recipe to the one that I proudly call my own today. You can’t buy it in a store (obviously), but if you have tons of money and want to go into business with me, I’m sure we can work something out! Or become my best friend and you’ll get a bottle every Christmas…and then you’ll be the one waiting 51 weeks for another! Versions of Krupnikas are available in liquor stores: Old Krupnik is a Polish liqueur, and the German brand Barenjager is another. And brands like Dewar’s and Jack Daniels are adding honey to their spirits as well. Team up with “the Brothers” and create a second line. I think it’s too soon for that. They need a lot more time to get the word out about their product. Plus, as you probably know, everybody thinks their recipe is the best. Two competing styles of Krupnikas from one company would probably not be a good idea. or they would be ‘complimentary’. And by the way, my recipe is the best. Mmmmm….our VT friends keep a stash of Barenjager in their freezer and we get to indulge in this fine spirit when visiting. I’ve been able to by grain alcohol in Mass and RI, so that part of the equation shouldn’t be difficult. As you know, every family has their own recipe, so finding the ingredients can be a bit of a challenge, though the internet has made all this vastly easier than back in the “old days!” Iki dugno! MAKING MUSTARD: SHOULDA DONE THIS SOONER!